The Palisade Insectary develops and distributes safe and effective biological controls for non-native weed and insect pests. The Colorado Department of Agriculture (CDA) has promoted the use of biological control in pest management since the 1940’s. 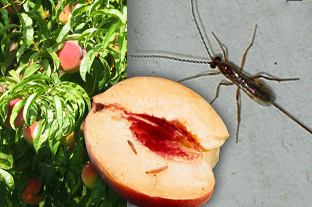 At that time, the Palisade Insectary first released biocontrol (parasitic wasps) for the use against the Oriental fruit moth, a serious pest of peaches in the fruit growing regions of the Grand Valley. The program was a success and continues to this day. The Palisade Insectary releases and monitors about 20 different species of biological control agents for use against both weeds and insect pests. Visitors to the Palisade Insectary should be sure to call in advance to ask about tour availability. This facility is primarily for research and biological science, but guests who have a keen interest in pest control or would like to learn more about a variety of different insect species are welcome to come and learn. Our insectary gets very busy during the summer months, so tour availability is limited. Call 970-464-7916 in advance to learn more or to schedule a visit.